The ‘Infinix 1212 celebration’ is a yearly event, which takes place on the 12th of December for Infinix fans and customer as a form of appreciation. Last year, Infinix put together a LIT event in Lagos for fans and customers to mark another successful year in Nigeria. 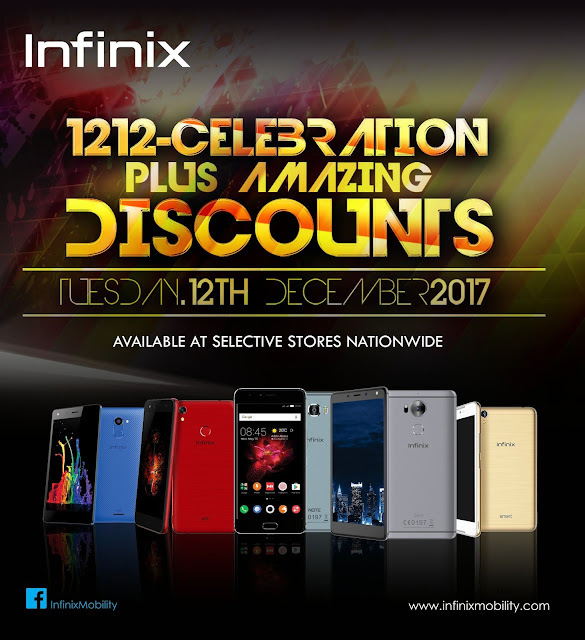 For the first time in the history of Infinix 1212, Infinix is offering a 1-day sale to customers with the celebration. This year’s Infinix 1212 Celebration will be a combination of a Mega party and the discount sale for customers to grab an Infinix device for as low as N30, 000 during the 1 Day celebration. Customers and fans who purchase an Infinix Device on that day at any store offline or Online on Jumia stand a chance to win free tickets to the biggest concert this December ‘Davido 30 Billion concert’ on the 27th of December. Customers have to buy the Infinix Note 4 pro, Infinix Note 4 pro with Xpen or Infinix Zero 5 to qualify for the raffle draw. Infinix will organize a raffle draw every week from the 12th of December till the 24th of December for customers who purchase any of the phones listed. Over 150 Infinix customers will be selected to win tickets ranging from Regular to Premium and VIP tickets with an all access pass for one Zero 5 customer to take pictures with Africa’s No1 artist ‘DavidO’ at the concert on the 27th of December in Lagos.